I have promised my son Tom for some time that I would write about my life. It is rather hard to figure how to go about that. I guess that the best way to start is at the beginning. That is why I am calling this story the beginning. I wrote a version of this and then wanted to check out a few dates. These were in a packet of Dad's papers I had in the safety deposit box. Guess what? Examining these papers caused a major rewrite. The general story is the same but there are many detail changes. My mother, Rhoda Ellen France, was born in, or near, Stanton, Mich., on 5 Sept. 1900. At the time I think her father was working as a teamster for a lumber company. Why, or when, he moved back to the Continental, Ohio area I do not know. I do know he was there in 1902, because Mother's sister Faye was born there then. She grew up on a farm her Grandfather France owned in Monroe Twp., Putnam County, Ohio. It was on the Putnam-Paulding County Line Road, about a quarter of a mile north of Ohio 613, north of the Nickel Plate Railroad (Norfolk Southern now). Grandfather France moved to the Napoleon area of Michigan. He used two teams and two wagons to move. He drove one wagon and Uncle John drove the other. Uncle John celebrated his 13th birthday on the road, thus they were on the road on 26 Oct. 1918. Grampa France said that with the flat heavy land in Putnam County he had troubles. In the spring of 1918 his milk bucket kept floating out from under the cows when he tried to milk. That decided him to move else where. I have heard from other sources that 1918 was a wet year. They had to put motors on the binders as the drive wheels slipped in the mud when they tried to cut the wheat. Later the wheat heads sprouted while still in the shocks. My father, Benjamin Harrison Steiner, was born in Greensburg Twp., Putnam County, Ohio on 3 Oct. 1888. Grandfather Steiner's farm was one half mile east of the wide spot on Ohio 115 called Cuba. There is one house and Saint Isador Catholic Church there now. The farm was on the North Blanchard River Road. Dad grew up on this farm. He went to the Forest Grove United Brethren Church and the Forest Grove (one room) School. He went there for eight years and graduated under the "Boxwell Exam method." Dear Father, I arrived OK, land is very rolling but of good quality. Will start to Dickson Tomorrow. B.h.S. Part of the way to New Orleans, he had an attack of appendicitis and had to have surgery. He had to sell his horse and buggy to pay for it. He had to give up and return to Ohio. After returning to Ohio, he bought a Russell steam traction engine and thrasher. He lost these when he could not pay for repairs to the steam engine. Dad enlisted in the U.S. Army 11 March 1918. He was sent to Columbus Barracks (Ohio) where he served in various Coastal Artillery Batteries. He was promoted to Private First Class 13 May 1918. On 20 Dec. 1918, he was transferred to Camp Devin, Mass. On 27Sept. 1918 he was promoted to Corporal in the 12th Company Portland, Fort Williams, Maine, of the Coastal Artillery. He worked on a 12-inch disappearing rifle, 12 inches being the diameter of the shell. He was discharged 5 Feb. 1919 at Camp Sherman, Ohio. He was discharged with a disability. As a result, he was provided the opportunity to go to veterinarian school at the government's expense. He had been a horse trainer as a young man and horses would remain a passion for the rest of his life. He apparently started at The Indiana Veterinary College of Indianapolis, Ind., in the fall of 1920. He was awarded the degree of Doctor of Veterinary Medicine on 20 May 1924. As part of his studies, he worked as an intern with Dr. Leatherman in Oakwood, Ohio. I do not know the exact dates of this internship, but it was prior to his being awarded his degree. As a single person, he ate in a restaurant. The only thing I know about the restaurant is the name of the cook, Rhoda Ellen France. The only reason I know this is that in the evening of 23 Dec. 1922, she married my father. This marriage took place in Jackson, Mich. Her father and mother, along with all the rest of their family, had moved to Michigan from the Continental/ Oakwood area of Ohio about 1918. My parents lived in Indianapolis until dad had his Doctor of Veterinary Medicine (DVM) degree (1924). They then tried to establish a veterinary practice in Greensburg Township, Putnam County, Ohio. They were living on the "Old Strite Place" when my brother James was born on 16 July 1925. This was during the time when agriculture was in a depression. Dad said he could not collect enough money to pay his medicine bills. So some time in 1927 he had to give up the veterinary practice. He took a job as a farm hand in Amboy Twp., Hillsdale County, Michigan. I am certain of the location because that is what is on my birth certificate. Needless to say I do not remember this at all. I have heard about it several times. Dad and I went by the farm in 1945. The house and buildings were gone, but there were still trees where they had been. The nearest town was Pioneer, Ohio and that is where the doctor came from. The farm was on the first east-west road north of the Ohio-Michigan state line. I think it was about two miles east of Pioneer. From what my mother said, times were rough. There was very little money. She said that one time they had a total of a single dollar bill to their names. Dad had gone to Somerset, Mich., and stopped at some friend's that had a gas station and general store. They gave Dad a bag of groceries to take home. Mother really lit into Dad because she thought that he had spent their last dollar. I do not remember their name but I do remember visiting there with my folks. I wonder if they could have found the farm job for Dad. Mother told me that the winter when I was born, the farmer allowed Dad to cut wood on the farm, but he had to carry it to the house by himself. Mother said Dad would cut the biggest piece he could carry on his shoulder. He would walk through the woods, about a quarter of a mile, to the house. He would then cut it into small enough pieces to put in the stove. I never understood why the farmer did not let him use a wagon and horses. I heard many times from Mother that during this period, I caused her problems. Mother had plenty of milk to nurse me but I, being my own stubborn self, refused the milk and wanted other food. To this day, I still do not like milk. When my parents left this farm I don't know. I do know that for a short while they lived in the Jackson, Mich., area. My Grandfather France told me that it irked my father to have to ask for help. I do not know how long they lived in Jackson. I do know that next they moved to Toledo, Ohio, where Dad found work in the Willys-Overland factory. Dad, based on his discharge paper, was five-foot-one and a half inches tall, was giving the job of stacking automobile frames. At this time we were living at 417 Eleventh Street, Toledo. While living in Toledo, Dad saw a notice that the Federal Meat Inspection Branch of the United States Department of Agriculture (USDA) was hiring veterinarians meat inspectors. Dad sent in an application. In a letter dated 20 June 1928, Dad was notified that he was awarded 10 points as a disabled veteran. A letter dated 27 June 1928 notified him that he had been awarded 94.25 out of 100 points toward an appointment. He received a letter dated 26 July 1928 asking if he would accept the position of Junior Veterinarian. A USDA letter dated 13 Aug. 1928 stated, "You are hereby notified that you have been appointed for a probationary period of six months, to the position of Junior Veterinarian --- at a salary of $2,000, per annum, effective August 13, 1928. ---- You will report for duty in person to Dr. D.R. Gillies" at 303 U.S. Barge Office Building, New York, N.Y.
Due to money problems. Dad had to go on to New York and leave Mother, James and me behind. Until he got his first pay check Dad spent the nights in New York Central Railroad Terminal. 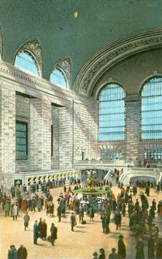 (Postcards of the terminal, now popularly known as "Grand Central Station," are seen at left and below right.) He would sleep as best he could on the benches. I guess he looked like any traveler waiting for a train. In the morning, he would use the men's room to clean up and shave. He had to do this until he received his first pay check. At that time government workers were paid once a month. When Dad got his first full check, he sent for Mother, James and me. Mother said that the train ride to New York was no fun. The weather was hot. James was three and I was about 10 months old. We left one day and got there the next. I well remember the folks talking about how poor the housing was that they could afford. They set the bed castors in jar lids filled with kerosene to keep the bugs out of the beds. Even then the bed bugs would crawl up the walls across the ceiling and drop on the beds. Mother said that our first year there we could not afford a Christmas tree. After Christmas they noticed some one had thrown out a fully decorated tree. They scavenged all the ornaments and tinsel. Real lead tinsel, illegal today. We still had some of the trimmings when Dad died in 1952. They only one I can remember now is a glass icicle. Effective 1 July 1929, Dad's pay was raised from $2,000 per annum to $2,200. Effective 16 Jan. 1930, Dad's pay was raised from $2,200 per annum to $2,300. Effective 16 Jan. 1931, Dad's pay was raised from $2,300 per annum to $2,400. Just think of a whole $200 per month, or $46.15 per week. I do not know exactly when, but my guess is that in January of 1930, Dad was transferred to Cleveland, Ohio. I know that at first we lived in Cleveland itself and then we moved to 24744 Water Street in Olmsted Falls, Ohio. I have a few memories of that place. A few years ago James said he found the house and somewhere I have a picture he took of it. At that time it was a rural home. I remember Dad carrying water from the well in a bucket. What I remember about that is his left arm sticking out for balance. I remember also sitting on his lap in an overstuffed chair and blowing soap bubbles. I think the chair was in the kitchen. That is the only room I remember being in. About 1931 we moved from there to 71 Adams Street, Berea, Ohio. It was a small journey, but I do not remember the move. I must have been three at the time. From the time we lived in this house, I have pretty fair memory of what happened. Up until then, I have had to depend on someone else's memory. I know I cut my forehead several times from running and falling against the window sills. This upset Mother something fierce. In the spring of the year I tried to ride my tricycle down a foot path that was soft mud. I got it stuck and Dad had to rescue me and the tricycle. Right next door to use lived a woman who became James' first grade teacher in the fall of 1932. No kindergarten there. I remember her cleaning the second story windows. She crawled partly out the window and set on the window ledge. Her feet were inside and her body out as she washed the upper panels. It scared me. I will write other articles, but this is the beginning, the part I had to depend on other people's memories for. In growing up, I had a tremendous advantage. I always felt wanted, loved, cared for and protected. So many children have never experienced this feeling.